Almighty ever-living God, grant that we may always conform our will to yours and serve your majesty in sincerity of heart. Through our Lord Jesus Christ, your Son, who lives and reigns with you in the unity of the Holy Spirit, one God, for ever and ever. Origins of the Catholic Church | Fr. Edward J. Berbusse S.J. And James and John, the sons of Zeb'edee, came forward to him, and said to him, "Teacher, we want you to do for us whatever we ask of you." And he said to them, "What do you want me to do for you?" And they said to him, "Grant us to sit, one at your right hand and one at your left, in your glory." But Jesus said to them, "You do not know what you are asking. Are you able to drink the cup that I drink, or to be baptized with the baptism with which I am baptized?" 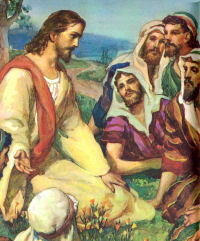 (Mk 10:35-38). The first reading is taken from the Book of the Prophet Isaiah, 53:10-11, and is the conclusion of the fourth Suffering Servant Song; Christ's divine gifts become our means to salvation. The second reading is from the Letter of St. Paul to the Hebrews 4:14-16 and discusses how Christ, our high priest, is greater than the priests of the Mosaic Law. Our confidence is based on Christ's high priesthood. He is the perfect priest because He is merciful and compassionate. As man, He has experienced the sufferings that affect us, although He was free from sin. Since He knows our weaknesses so well, He can give us the help we need, and when He comes to judge us, He will take that weakness into account. We should respond to the Lord's goodness by staying true to our profession of faith. A Christian needs to live up to all the demands of his calling; he should be single-minded and free from doubts. The Gospel is from St. Mark, 10:35-45. Our own natural inclination most likely would be to react like the other ten Apostles and become vexed with James and John and to tell them what we thought of their selfish worldly ambitions. However, our Lord's gentle answer: "you do not know what you are asking" shows us that ignorance of the nature of the kingdom he was going to set up, was the cause of their very human ambitions. They, with the other Apostles, had still the common Jewish idea of the messianic kingdom. They thought the Messiah—and they were now convinced that Jesus was the promised Messiah—would set up a political kingdom in Palestine, oust the pagan Romans and eventually extend his kingdom to all nations. That this kingdom he would set up would be universal, extending to all nations, was indicated in almost all the messianic prophecies in the Old Testament, but that this kingdom would be spiritual, not political, was not grasped by most of Christ's contemporaries including the Apostles. Jesus, knowing that his Apostles still had this wrong idea, was gentle with James and John. He took this opportunity to tell them that he would set up a glorious kingdom but that his sufferings and death would be a necessary prelude to its establishment. He had already referred to his sufferings and death three times, but the mention fell on deaf ears. Their argument was: how could he suffer death when he has still to establish his earthly kingdom? The truth in fact was that it was by means of his sufferings and death that he would establish his glorious kingdom. He challenged the two Apostles then to know if they were willing to pay the price for a high place in his glorious kingdom: were they prepared to follow him through suffering and death? He accepted their affirmation, knowing it to be true, but told them their position of honor depended on his Father's decision. Once they realized the nature of his glorious kingdom they would be the last to look for positions of honor in it. While no Christian today thinks that Christ came on earth in order to make us wealthy, happy and prosperous during our few years on earth, there are, unfortunately, many Christians who are unwilling to accept Christ's teaching that the way to heavenly glory is the way of the cross. "All this and heaven too" is their motto. It would, of course, be marvelous if all our days on earth were days of peace, happiness and prosperity to be followed by eternal happiness when we "shuffle off this mortal coil." But any man who has the use of reason sees that our world is inhabited by weak, sin-inclined and usually sinful mortals, himself included-weak mortals who can and do disturb the peace and harmony that could regulate our mortal lives. There are "accidents" on our roads and highways every day of the year, frequently causing death or grave injury to hundreds. The rules of the road, if kept by all, would prevent ninety-nine percent of such accidents—the other one percent are caused by mechanical failure. Would any man be so naive as to expect that we could have even one day free from car accidents? Because man has a free-will, he is liable to abuse it by choosing what is sinful and wrong. Most of the crosses and trials we meet in life are caused by violations—by ourselves and others—of the rules of life and the laws of charity and justice. To prevent this abuse of free-will, God would have to deprive men of that essential gift which, with his intellect, makes him a man. Likewise, we could prevent all road accidents by removing the steering wheels from cars but then we would have no cars. Let us face the fact, almost all the hardships and sufferings which we have to bear in life, are caused by the unjust and uncharitable actions of our fellowmen and even God himself, following his own wise pattern of life for men on earth, cannot prevent such evil actions. Would God want to prevent all such injustices and all this inhumanity of man toward his fellowman? Not that he approves of it, much less causes it, but can he not have a purpose in permitting it? How would we, his children on earth, earn heaven if this world were an earthly paradise? What loving father would keep his children from school because they found it a hardship, and when they could be so happy playing at home all day and every day? School is absolutely necessary for those children's future, and it is because fathers are truly kind to their children that they compel them to undergo this temporary hardship. God is the kindest of fathers. He wants us all in heaven. He has mapped out the road which will lead us there. He allows these hardships to come our way so that we can prepare for our real future life. With James and John, let us tell our divine Lord that we are ready to follow him on the path to Calvary; that we are ready to drink the cup of sufferings which he drank and to be immersed in the sorrows which he endured. He went through all of this for us; we are doing it for our own sakes. He carried the real cross—ours is light when compared with his; furthermore, he will help us to bear our daily trial and struggles. How could any Christian become weary and fainthearted when he has Christ helping him on the road? "Render. . .to Caesar the things that are Caesar's, and to God the things that are God's (Gospel). In today's Mass the Church bids us prepare "without offense unto the day of Christ," that is, the day of Final Judgment (Epistle). Hence St. Paul prays with us today that our "charity may. . .abound in . . .discernment." Yes, "discernment!" lest we be deceived by the tricky questions of Pharisee friends and foes, or even the Pharisee spirit in our own conscience. Jesus gives the answer: "Render. . .to Caesar the things that are Caesar's" (symbolized by small figures at right), "and to God the things that are God's (symbolized by small figures at left). On this Sunday, officials and citizens alike may well cry out "from the depths" (Introit) for forgiveness of their failure to prepare.